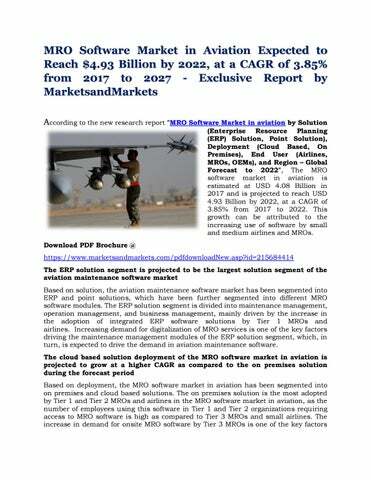 projected to drive the growth of the MRO software in aviation market in the cloud based solution deployment segment. Asia Pacific is estimated to be the largest market for MRO software in aviation in 2017 Asia Pacific is estimated to account for the largest share of the MRO software market in aviation in 2017. Countries considered for market analysis in this region include Singapore, China, India, and Japan and rest of the countries in the Asia Pacific region. China is projected to be the leading market for MRO software in aviation in the Asia Pacific region during the forecast period. Increasing deliveries of commercial aircraft and maintenance and repair facilities in China are contributing to the high demand for MRO software in aviation in the Asia Pacific region. In addition, the presence of key MROs and airline maintenance facilities in China is another significant factor influencing the growth of the MRO software market in aviation in the Asia Pacific region. 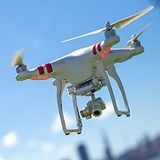 Ask for Sample Report @ https://www.marketsandmarkets.com/requestsampleNew.asp?id=215684414 Key Market Players Key companies profiled in the aviation maintenance software market, include AerData (A Boeing subsidiary) (US), HCL Technologies (India), IBM Corporation (US), IFS (Sweden), Oracle Corporation (US), Ramco Systems (India), Rusada (Switzerland), SAP (Germany), Swiss AviationSoftware (Switzerland), and Trax (US), among others. These companies are focusing on the adoption of various growth strategies to enhance their presence in emerging economies worldwide. Don’t miss out on business opportunities in MRO software market in aviation. Speak to our analyst and gain crucial industry insights that will help your business grow.